The ultimate gift for any whisky lover! Treat them to a voucher for Drams in the Dark whisky tasting experience at Mac & wild. 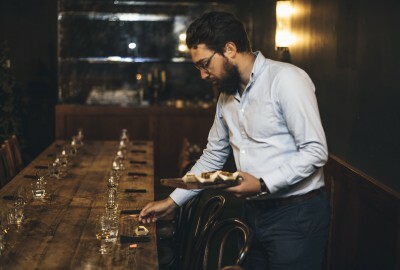 Drams in the Dark takes guests on a whisky tasting experience like no other, leading them through a tasting of several drams with senses heightened by complete darkness. Darkness and our senses have always been a potent concoction. Throw in a dram of whisky or two and we’re instantly transported to new depths of palette and sensory euphoria! Guests are invited to challenge their senses to the most intimate of whisky adventures. The experience commences with candlelit welcome drinks and a warm introduction from your tasting host. Taking time to relax and familiarise themselves with their surroundings, a gradual dimming of lights signals the beginning of the tasting experience before being plunged into total darkness. The host invites guests to deepen their tasting experience by becoming submissive and mindful of their instantly heightened senses. Each dram is accompanied by a complementing canapé. The overall experience lasts approximately 1.5 hours with interaction welcome as the guests feel comfortable. Sessions run every Friday and Saturday night at our Devonshire Square Restaurant in the City (close to Liverpool Street Station). Not valid in conjunction with any other offer. Vouchers valid from 3/1/19. Bookings available Friday and Saturday evening subject to availability. Tasting experiences are held as open groups where individuals can purchase tickets to join in with others also taking the experience.